Stacey Brook reviews the Nebraska Huskers performance over the last five season under coach Bo Pelini. 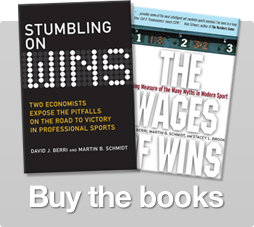 Dre reviews the origin of the “parity myth” that grips pro sports. Dave examines the roll of coaching and success in pro sports at Freakonomics. He shines this lens on his abysmal Lions and asks if a coaching change is needed. Dre examines a key difference between the NFL and NBA and how Dave can be optimistic about his Lions.